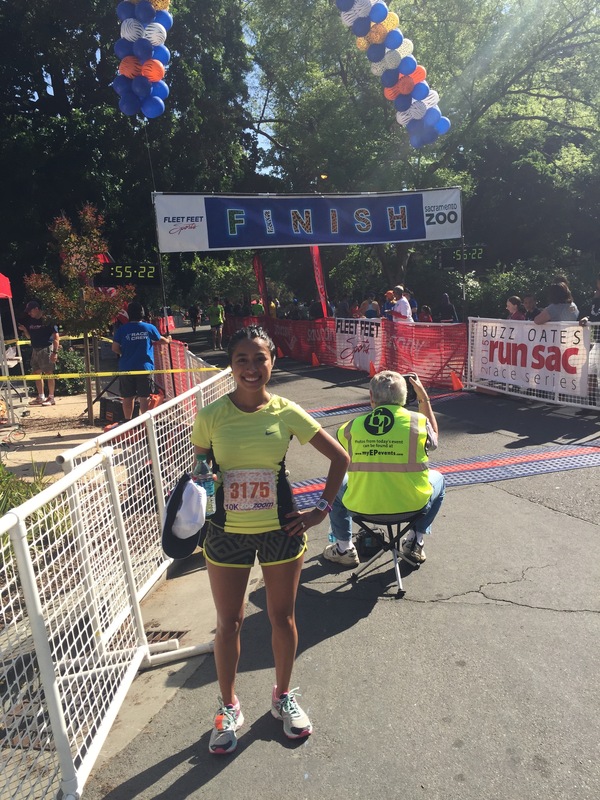 On Sunday, April 19th, I ran the Zoo Zoom 10k which helps fund the Sacramento Zoo. I decided to sign up at the last minute and since my cousin Aaron was in town from San Francisco, he joined me. I was a little nervous about this run because I over indulged the Friday and Saturday before the race. When I say over indulged I mean, I went kinda crazy. I’m not much of a drinker (because I drank ridiculous amounts in college) and for some reason decided to drink Friday night when I went out with our family. Poor decision #1. Around midnight that night, I also thought it would be a good idea to head to a local restaurant called Petra’s for a chicken pita, fries, and a soda. Poor decision #2. Petra is delicious but drinking and late night eating are never a good combination. Saturday morning instead of going on a run as planned, I walked over to Hot Italian for their breakfast pizza. Poor decision #3. Now, I’m not saying that any of these things are poor decisions on any regular weekend. Enjoying a few drinks here and there along with delicious late-night eats is always fun. However, the weekend of a race-not so fun. My poor decisions one, two, and three, left me wondering if I should rename my blog “Running for Junk” instead. On Sunday morning, I made sure we got to the race super early since Aaron hadn’t registered yet. I hate being late and not having enough time to visit the porta potties multiple times. The weather was perfect and we made it early enough to watch the animal costume contest as well as the start of the 5k race. The picture above cracks me up because Aaron suggested I tilt my head back since I was wearing a hat-clearly, I didn’t get it. And what’s with my odd little grin? On our way to the car to drop off some of our personal items, we saw my running buddy Abby! She was running the 5k with her daughter Stella (who is in the stroller and was not feelin’ our photo op). Abby and I run together almost every weekend and it’s always a treat to see her, unexpectedly, at races. I have a pretty good idea of how fast my cousin runs since we’ve completed several races together (two half marathons in San Francisco and a Thanksgiving Day 10k). 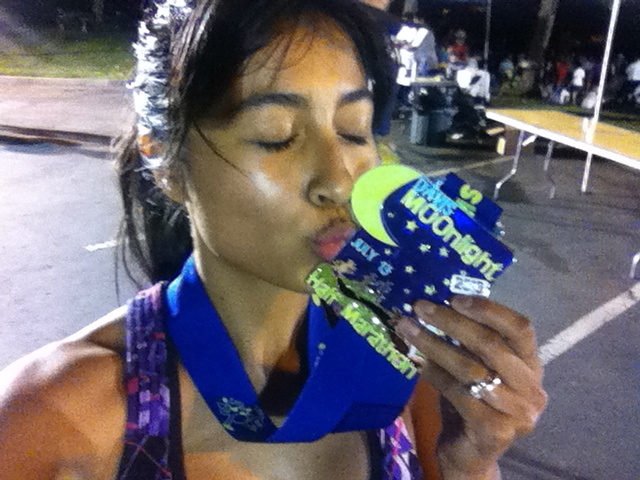 I really had no specific expectations for this race-I hadn’t set a goal. I just thought it would be a beautiful day, to spend time with my cousin, doing something we both love. 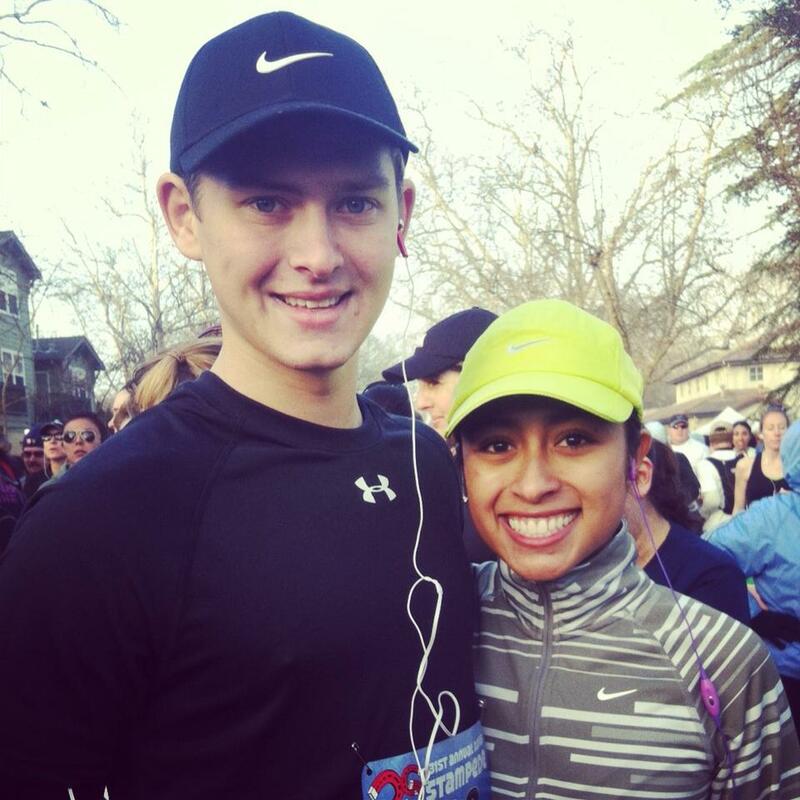 We started the race together and I soon noticed we were running at a 7:50 min/mile pace. I was really just trying to keep up with him. I think he was going at a “slower” pace to take it easy on me. Meanwhile, my little legs were working hard. I told Aaron with excitement (and shock) that if I stayed with him I may set a personal record. At that point, Aaron wanted to help keep me on track and continued to lead the way. He stayed about two steps ahead of me which kept me motivated. It was pretty funny that I decided not to wear my earphones because Aaron didn’t have a pair but we quickly realized that we were not really in the “talking and running” mood. We were FOCUSED! I typically run with music but this day I focused on my breathing and soaking in every minute of the beauty that surrounded me. Running for me is a great time to reflect on my blessings. Many times while running I name all of the things/people I am thankful for and feel inspired to keep moving. Overall the race was terrific! I got a PR for both my 5k and 10k. Aaron and I couldn’t stop smiling and I literally could not thank him enough for motivating me. It’s a very rewarding feeling to finish a race strong. 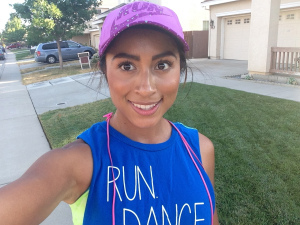 It made me realize that I run better and faster when I go into a run with zero expectations. After my last half marathon, I felt disappointed because I had not finished “fast enough”-which is silly I know, since I STILL completed 13.1 miles. I’m convinced that not setting any expectations for the ZooZoom and feeling relaxed and grateful, is why I was able to set personal records in both distances. To my surprise I ended up placing 4th in my age group. I was shocked when I saw this! I started singing and dancing to Dan while we were driving. I’m in a tough age group: 25-29. It has really fast women and for once I was a part of that group. It felt good knowing that my hard work day in and day out is paying off. I wasn’t the fastest and know about a dozen people who can beat my time but I was still proud that I was able to achieve top 5 at a race. Later that evening, Dan and I went to a food trucks event for dinner-as a treat for my run. I ended up back at William Land Park where Sacto MoFo was hosting a food truck night. There was live music, bounce houses, picnic areas, and of course FOOD. I couldn’t decide what to eat-everything looked and sounded delicious! We walked around in circles until I finally let my belly do all the talking and we decided on sea food. I ended up ordering a lobster roll. Back in my flight attendant days, everyone would rant and rave about lobster rolls (specifically the ones from Boston) and I wanted to see what all the fuss was about. Sadly, I was disappointed. Our meal cost about $35 and we were both still really hungry afterwards. Dan ordered cajun shrimp tacos. Poor guy was sadly disappointed as well. Even though our food truck experience wasn’t great we still had a good time chatting on the grass and enjoying the beautiful weather. I hope the lobster rolls in Boston are much better than the one I had. I’m fortunate to have family and close friends who share my love for running. This feeling, both Aaron and I shared of accomplishment, will forever be embedded in my heart. I can apply it to any aspect of life and that’s one of the magical things about running. And ultimately, if I can do it, you can do it too. Becoming a runner can sometimes seem intimidating, but following these few steps will help you ease into it. I always remind myself and my friends that if you run, you’re a runner. Whether you run 1 mile, 5 miles, 26.2 miles-if you run, you’re a runner! It’s simple. So how do we as runners get started? The steps I’ve outlined below are what helped me. I hope you find them useful. 1. Sign up for a race! I’ve always noticed I am more consistent with running when I have something to work towards-a goal. Signing up for a race is easy and a great experience. The camaraderie between runners, the adrenaline in the air, the motivation all around you-it’s like nothing else. Start small and sign up for a 5K (3.10 miles), then eventually a 10K (6.2 miles), and next thing you know, you’ll be training for your first half marathon (13.1 miles). 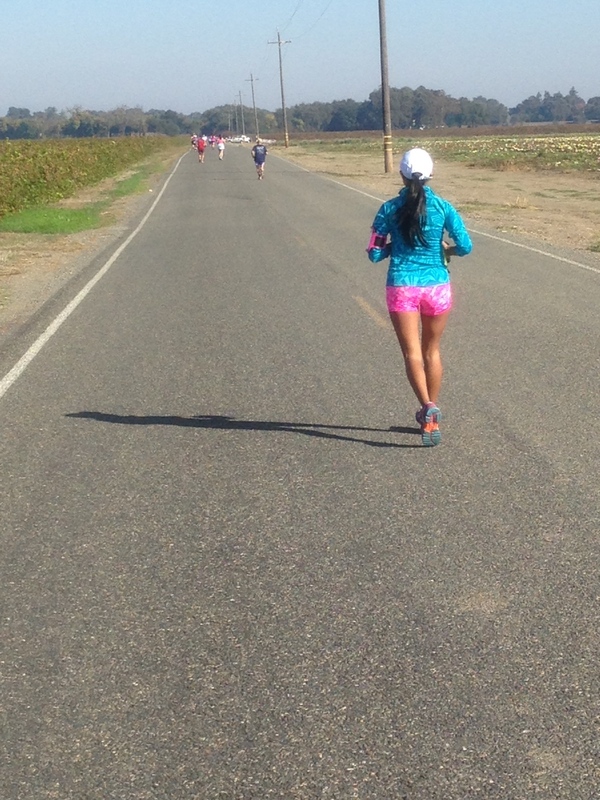 Below are links to find races in California for 2015. 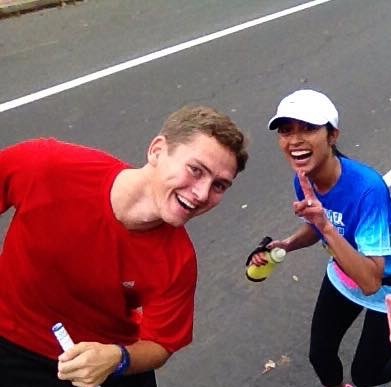 If you are interested in running a race in Sacramento through Sacramento Running Association as a host, you can use promo code “SRA46” for a discount. 2. 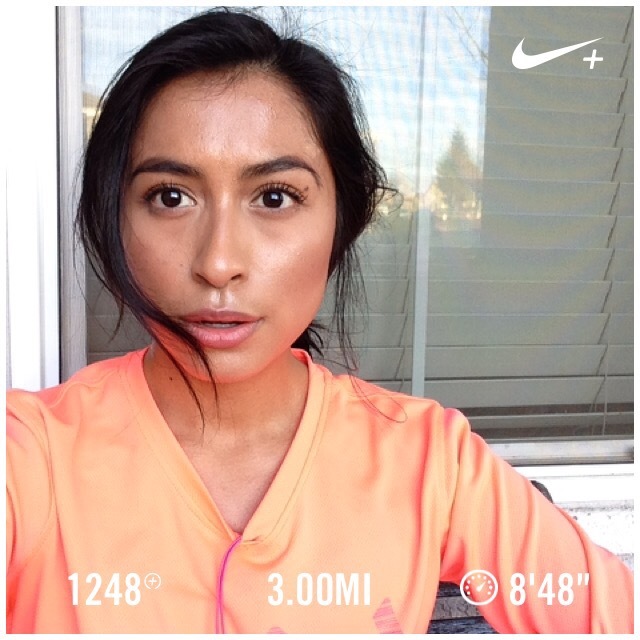 Use a free app to track your runs. When I first started running, I didn’t track my runs which meant I had no idea how far or fast/slow I was actually going. Using an app like Nike Plus Running (my app of choice) or RunKeeper, will help you stay consistent and keep track of your progress. These apps are free and keep a log of your daily miles, pace and calories burned. 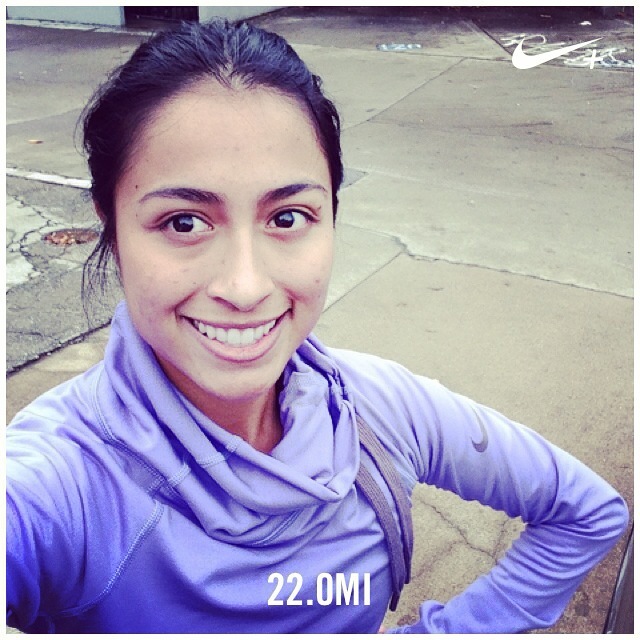 They even allow you to upload photos which show the distance you ran. Celebrate your achievements and let the world know you ran! 3. Make a running playlist. I love, love, LOVE making running playlists. I use Spotify because it has a great variety of music I can pull from. I’m very meticulous about my playlist. It starts off slower to keep my first few miles at a more comfortable pace and then builds up to faster music. If I keep up with the faster beats, I know I’m running at my desired pace. A lot of my songs bring happy memories and the positive thoughts keep me motivated. My playlist is available under my name, Tiffany James, and is called “Run Gurl” if you are interested in a combination of electro music, throwbacks, and some Latin spice. 4. 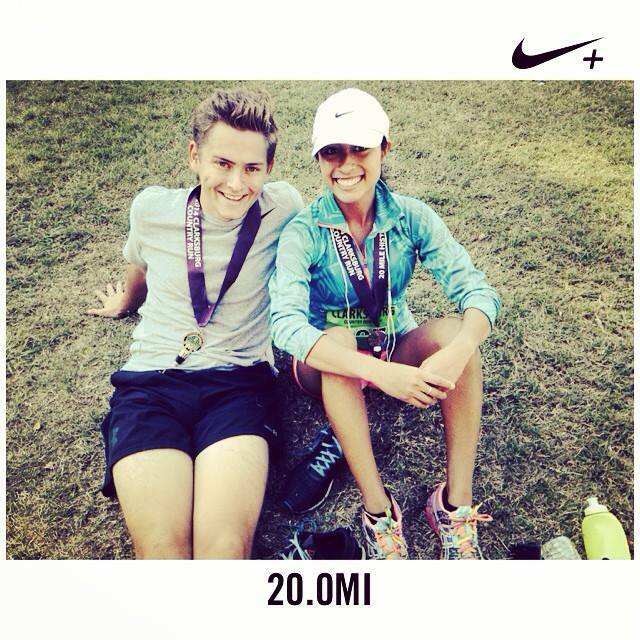 Set one attainable goal a week…..build mileage. Set goals for yourself weekly-something feasible you can work towards. 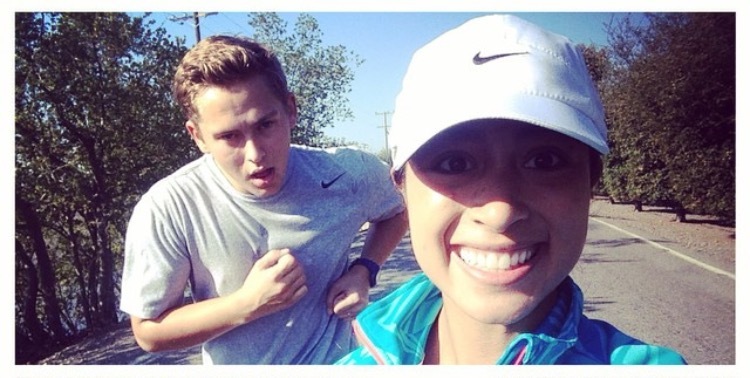 For example, on your first week of running you can set a goal of completing one mile. Start at home, go out 0.5 miles…and then you really have no choice but to turn around and go home! I mean, unless you call someone to go get you…but don’t do that. Do that every other day until you can run that mile without stopping or walking. Next you can try to run from home, out 3/4 of a mile, and back-BAM! You’ve then completed 1.25 miles. Try not to create limitations or excuses. It will get easier if you just give yourself time. 5. Don’t compare yourself to others and have fun! Try not to compare yourself to anyone else. This is definitely easier said than done-for me anyway. I force myself to remember that everyone is different and what may be easy for some will not be easy for others. Most runners will tell you they stick to running because they are passionate about it and truly love it. Take time during your run to reflect and appreciate your life, your experience, and where you’re at with your running. A big part of becoming a stronger runner for me was learning how to breathe-sounds pretty simple right? WRONG! You can’t disregard your breathing because if you do, before you know it, by half a mile, you’ll be panting like you’re dying. Figuring out how to breathe well during your run will help you get less side stitches and improve your posture. I’ve included a link from Runner’s World that will help your breathing technique. The sooner you can control your breathing, the sooner you can increase your speed and/or distance. 7. Get fitted for running shoes. If you enjoy running and it feels like something you may want to stick with, I suggest getting fitted for proper running shoes. This may cost anywhere from $100-200 depending on the shoe type, but the investment is well worth it. Your feet and body will thank you later. Proper running shoes will help your body stay injury free and provide the adequate support for running. If you live in the Sacramento area Fleet Feet of Sacramento is a great place to buy your first pair of running shoes. The staff is terrific and attentive. They will take their time to watch you run and recommend the best shoes for YOU. 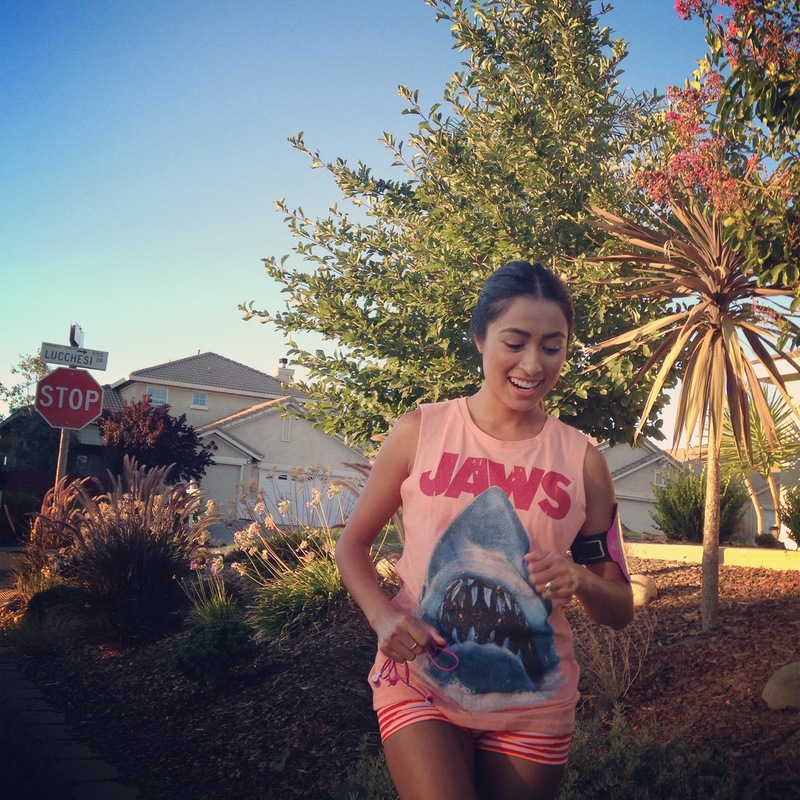 These are just a few tips that helped me when I first started running. Please remember to go at your own pace. Enjoy every minute of it and just keep running! You’ve got this!